*Lorenz Font is a new star on the rise! She never fails to tell compelling tale that evoked emotional reactions in readers. 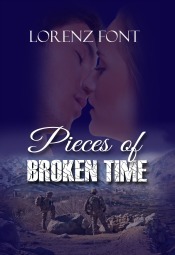 Her novel, Pieces of Broken Time is an enjoyable tale of second chances in life. * I am not sure I have read another story about PTSD and returning warriors that capture the emotions and reality like this one does. * This is a story of love yes but it’s so much more , it’s a journey through the darkest reaches of pain and on the other side? Hope!